Get the perfect texture to your cake and learn how you can make bread ahead of time with Dan Lepard’s top tips and trade secrets for bakers. With every recipe check you have every ingredient or make sure you’re clear in your head what you’re going to substitute before you start. This means that you’ve read the recipe from start to finish. Then get ready to bake. If the recipe is a quick one, like a cake that takes 15 minutes to mix, I turn the oven on before I start. Make sure the oven shelves are in the right place, then line the cake tin and have it ready. If the butter is too hard to beat, chop it into small chunks and very slightly melt it in a pan or microwave so that a third of the butter is liquid. Then add the sugar and beat it hard and everything should come together to a light and creamy consistency. I sift the flour and baking powder together two or three times when making a cake (never for pastry or bread making). Though this isn’t essential, it will give your cakes a very light, even texture and stop those pea-sized air pockets forming in the crumb. With yeast dough making, it’s often better to start with the dough warm and cool it down if you need to rather than start with everything icy cold. This is because dry yeast needs a little warmth to begin with to break down the outer surface of the granules and activate the yeast clusters. So if it’s a bit chilly rinse the mixing bowl out with boiling water, and if the flour is cold make the water temperature a bit warmer to compensate. Recipes used to say you can test if the dough is ready by pressing it lightly with your fingers and if the dimple springs back leave the dough longer. This is wrong! Simply wait until the dough has almost doubled in volume then bake it. Part-bake your own bread to save time another day. A small 400g loaf of bread will be set after about 25 minutes in the oven at 200C, rolls in about 15 minutes, but the crust won’t have properly formed. Just take the loaf out of the oven still on the tray and leave it to cool undisturbed. Then freeze it sealed tightly in a zip-lock bag or similar. Re-bake it from frozen in a 180°C oven for about 15-20 minutes to rebuild the crust. 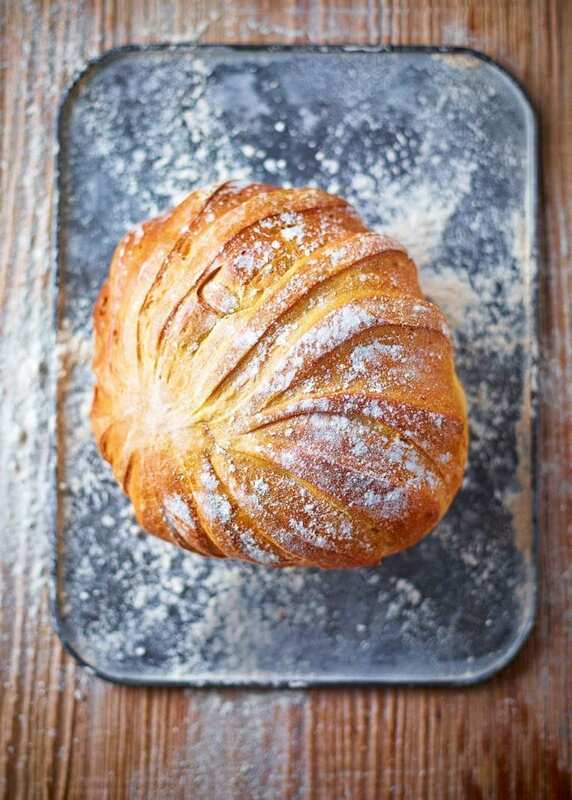 Read the our step-by-step guide on how to make bread and find many of our bread recipes here.